Direct microfabrication method which requires no intermediary and directly process the fabric you selected for your future microfluidic chip. 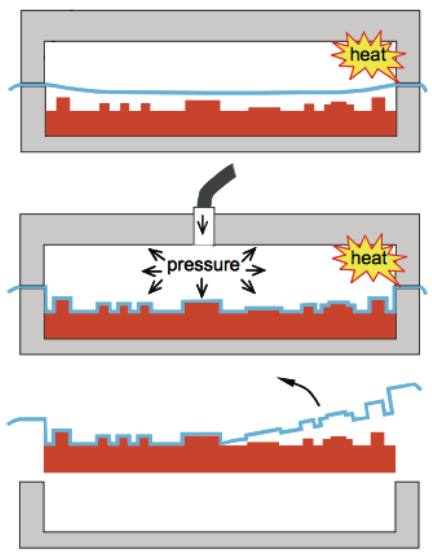 Many techniques (injection molding, hot embossing, polymer ablation,…) can be used for the fabrication of microfluidic chips, but only blow molding technique, which is an indirect microfabrication method, is presented here. The process to obtain the needed intermediary master to produce the chips will not be explained. Schematic blow molding process to create cartridges out of thermoplastic foils.Images source: . Blow molding is usually a method by which hollow plastic parts are formed like plastic bottles. The most frequently used materials in blow molding, regardless the targeted domain, are the following ones. Polyethylene (Low Density (LDPE) and High Density (HDPE)), Polypropylene (PP), Polyvinyl Chloride (PVC) and Polyethylene Terephthalate (PET). extrusion blow molding ー A hot hollow tube of thermoplastic material is dropped from an extruder with a rotation screw and is then captured in the closed blow chamber. Compressed air is injected through the open end of the thermoplastic tube to push the material against the wall. Advantages: simple, low costs, fast to setup to begin production; disadvantages: production speed is slower than other newer blow molding methods, not suitable for precision parts (might not be suitable for microfluidics), wall thickness is difficult to control. injection blow molding ー combines injection molding (first part of the process consists in melting the material in a first mold) and blow molding (the preform is then placed in the blow molding chamber – second mold – and compressed air is blown to push the material against the walls with the wanted design). Advantages: faster production speed and higher precision than extrusion blow molding, net cost may be lower in high volume production; disadvantages: the setup costs are higher due to two different molds, it may take longer to setup to produce the first product, less flexible in adjusting for different product gram weights. stretch blow molding ー very similar to injection blow molding except the fact that all the process is done in only one mold. A small piece of thermoplastic material is preformed to a test-tube shape and is then used to inject compressed air via the blow stem while the blow stem is pushing forward to stretch the preform further into the mold until the preform reaches the wall of the mold. Advantages: very fast production speed, very repeatable and stable product quality; disadvantages: very high setup costs (need extremely high production volumes (in the millions) to be justified), will take longer to setup, less flexible in adjusting for different product gram weights, limited to certain plastic materials, such as PET (Polyethylene Terephthalate). Those three common blow molding methods used in a wide variety of domains are based on melting the material and then blow it in order to make it go against the walls of the blow chamber to be shaped. However, in microfluidics, use of thermoplastic foils are often presented to create some designs: lab-on-a-chip cartridges (Lutz et al. , Focke et al . presented a way to use blow molding in order to design lab-on-a-chip cartridges with very thin sidewalls of 100 to 180 µm using different type of polymer (COP foil, PMMA, polypropylene or polyethylene)). 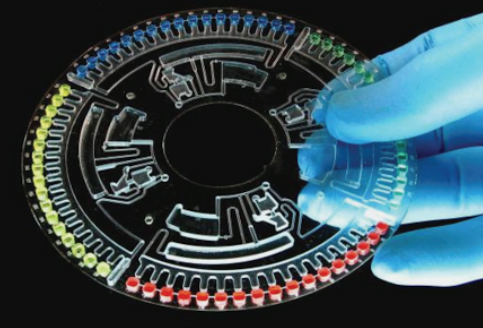 Image of a thermoformed cartridge with four sectors of microfluidic structures for a Real-Time PCR. Images source: . N. E. Steidle, Micro- and Nanostructured Microfluidic Devices for Localized Protein Immobilization and Other Biomedical Applications, 2014, Karlsruhe Scientific Publishing, pp. 38-44. S. Lutz, P. Weber, M. Focke, B. Faltin, J. Hoffmann, C. Müller, D. Mark, G. Roth, P. Munday, N. Armes, O. Piepenburg, R. Zengerleabe, F. von Stettenab, Microfluidic lab-on-a-foil for nucleic acid analysis based on isothermal recombinase polymerase amplification (RPA), Lab Chip, 2010, 10, 887–893. M. Focke, B. Faltin, T. Hösel, C. Müller, J. Ducrée, R. Zengerle, F. von Stetten, Blow molding of polymer foils for rapid prototyping of microfluidic cartridges, 2008, Twelfth International Conference on Miniaturized Systems for Chemistry and Life Sciences.